On 30 April 1975, the last Americans and some of their South Vietnamese allies were evacuated from the United States embassy compound as Saigon – soon to be renamed Ho Chi Minh City – fell to forces of the People’s Army of Vietnam and the National Liberation Front of South Vietnam (the Viet Cong), ending America’s twenty-five-year involvement in Vietnam’s struggle to liberate itself from first French, and then American, imperialism. The Vietnam War remains one of the Boomer generation’s defining moments. John McCain’s recent death reminded America of the divides caused by that horrific war: while some mourned a war hero who endured years of torture at the hands of the North Vietnamese, we were reminded that, like many from his class, President Trump used privilege and a weak medical excuse to avoid the war. In a recent column marking the fiftieth anniversary of the 1968 Democratic National Convention, E. J. Dionne wrote that the Democratic Party “never fully recovered from the wrenching schism opened by the Vietnam War.” No matter how one experienced it, much like the Civil War, Vietnam will continue to shape America’s culture, politics, and self-image for decades after the last veteran, the last privileged draft-dodger, and the last peacenik have left us. Moreover, what the Vietnamese people call “the American War” will continue to haunt them in a much more intense way. Five days after the last chopper left the roof of the American embassy, Garry Trudeau began writing about America’s defeat. In the weeks and months following the end of the war, at least four separate Doonesbury storylines addressed the war’s aftermath from the points of view of the Vietnamese people who managed to escape victorious communist forces, American and Vietnamese soldiers who fought the war, and the political class that conceived and executed what was, until the invasions of Afghanistan and Iraq, America’s worst foreign policy and military disaster. 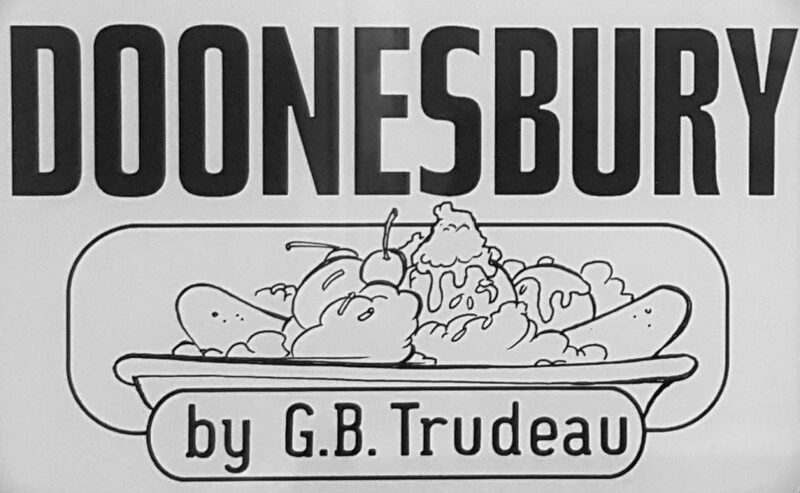 Well before Hollywood films like The Deer Hunter and Apocalypse Now began to dissect the Vietnam experience for moviegoers, Trudeau was using the funny pages to help America understand what Vietnam meant, and what it would mean going forward. On May 5, 1975, the last Vietnamese war orphan to be sent to the United States was flying across the Pacific Ocean to meet her adoptive parents, who would name her Kim. The first thing about baby Kim that must be noted is that she is, hands-down, the cutest character that GBT ever drew; Trudeau rarely does “cute,” but he nailed it here. Beyond her cuteness, Kim’s precocious self-awareness and political insight forced readers to confront the question of how to start understanding, and moving past, the tragedy of Vietnam. …but her grandmother has a different take on what that symbol means. Doonesbury, 15 May 1975. It wasn’t just the motivations behind, or potential effects of, the presence of one orphaned baby that were brought into question following America’s defeat in Vietnam. Perhaps unsurprisingly, as Kim settles into her new digs, B.D. is upset that 100,000 people who “let themselves get beat” are being given refuge in America. Revealing how initially unpopular the idea of opening America’s doors to the people that the country had invaded, occupied, and ultimately failed, the normally reactionary B.D. had an unusual ally. Jerry Brown, the liberal governor of California, attempted to halt the arrival of Vietnamese refugees, citing both California’s unemployment rate and the fact that the state already had a large Hispanic population as reasons why the presence of Vietnamese people would have a negative effect on his state. And yet, while many Americans now celebrate the Vietnamese presence in the US as evidence of America’s ability to incorporate immigrants into the national fabric, in 1975 Garry Trudeau was not hopeful about the Vietnamese who had come to America. To be clear, he said nothing that reflected the nativism of Governor Brown and his supporters; rather, GBT could only see an insurmountable wall, caused by years of American lies and aggression, separating the Vietnamese refugees and their new compatriots. The gap is evident in the exchange between Mr. Duy, a Vietnamese refugee, and the American family who invites him over for drinks; awkward comments and equally awkward silences seem to show us that Trudeau had strong reservations regarding America’s ability to understand, and accept, these newcomers. Trudeau’s treatment of the arrival of Vietnamese refugees in 1975 mirrors an previous arc he drew two years earlier, this one about Cambodian refugees. In 1973, Phred the Viet Cong terrorist took some well-deserved R&R in Cambodia. After visiting a camp for refugees fleeing America’s “secret bombing” of Cambodia, Phred brought some of them to Washington to testify in front of the Senate Armed Services Committee. Unlike the Vietnamese refugees who would arrive two years later, the Cambodians were warmly received in America, and housing a refugee became something of a status symbol among the DC upper crust. [29NOV73] On the other hand, like the Vietnamese refugees, the Cambodians found themselves sharing awkward silences with their American hosts, as the cultural differences between the two often seemed insurmountable. Like Mr. Duy with his American host, Lol Nol Tol finds himself in an uncomfortable social encounter with an American with whom he seems to share little common ground. Not a lot of common ground here. Doonesbury, 6 June 1975; 30 November 1973. But while the Cambodians and the Vietnamese seem to have little in common with their American hosts, there was a possible bridge: a shared love of that great equalizer, American consumer culture. American culture – specifically culinary culture – was woven throughout the Cambodian refugee arc. The Cambodians were smuggled into the United States in empty Coca-Cola crates; Lol Nol Tol’s host is uncertain whether or not Minute Rice would be to his taste; a senator’s secretary treats 300 of the Cambodians to lunch at McDonalds’s. For people for whom food is a pressing concern, American plenty has its appeals. In a previous post, I argued that Phred humanized the Vietnamese people to comics page readers. His role as a someone who reminded Americans that those who were most affected by American war-making in south-east Asia was made explicit in the Cambodian arc: he brought the Cambodians to the United States to show Americans that they were “not just so many small yellow people, but rather we are human beings like themselves who only ask for a small chance at happiness.” Kim, also hoping for “a small chance at happiness,” joined the cast as a symbol of American failure and a desire to atone for a profound wrong. However, reactions to her presence, and that of other refugees, demonstrate that many Americans were eager to forget the whole sorry episode of Vietnam, and that the racism at the heart of the American war on Vietnam would continue to shape relations between the United States and the Vietnamese people. That said, Kim’s longer arc reveals Trudeau’s ultimate faith in America’s ability to live up to its stated values. Later strips showed that Kim’s road to acceptance in America did not always run smoothly; as a teenager, she was singled out for classroom and schoolyard abuse growing out of stereotypes about over-achieving Asian-American kids. However, her ultimate role as an anchor for Doonesbury’s titular character is a sign that, in the decades after what remains America’s most grotesque war, for some, a degree of healing was possible.